Over a hundred women responded to this call from the Middlesex County Regional Chamber of Commerce (MCRCC) during their 2014 Women’s Leadership Summit in Somerset NJ. Highlight of the event was the presence of Elizabeth Williams-Riley, President and CEO for the American Conference on Diversity as a keynote speaker. 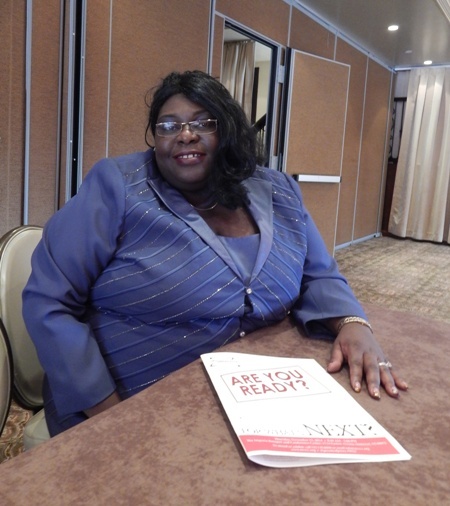 Elizabeth was recently distinguished as one of 2013 Women Worth Watching and featured in national publications such as Diversity Journal and Diversity Best Practices. “Our organization is rooted in the New York’s National Conference of Christians and Jews founded in 1927. New Jersey, one of the most diverse states in the country, started its initiative under the name of American Conference of Diversity in 1948 to promote respect and inclusion among our communities,” Elizabeth told LatinasInBusiness.us in an exclusive interview. Through experimental learning, dialogue, activity seminars, role-playing and other all-encompassing techniques, the organization offers conflict management and preventive diversity education and awareness in school-based programs and workplace training sessions. “We do not respond to incidents,” Elizabeth explains, “but we create an environment for the understanding of differences and opportunities for growth building positive messages in early childhood and among our youth. We also extend our activity to the workplace through community partnerships with main stakeholders such as government and industry leaders with whom we build action plans,” she shared. Elizabeth invited the audience to visit the American Conference on Diversity and become involved with their pursuits as a volunteer, a strategic partner or requesting some of their services. The Women’s Leadership Summit also included a panel of young leadership speakers: Abby Kohut, better known by her site “Absolutely Abby” selected as one of “Top 100 Websites for your Career” by Forbes Magazine in 2013; Taryn Lamb, President of Organized Havens LLC, a company she founded in 2006 to help people get organized and improve their lives; and Maybelle Jadotte, Business Community Manager for Port Authority of NY/NJ Office of Emergency Management (OEM). Roundtable breakup sessions also featured 10 facilitators with topics that offered the audience a wide range of choices, from social media to wealth management. The event was crowned by the 2014 Health and Wellness Expo which featured a dozen expositors and offered health screenings and information to the attendees. Click on pictures to see some of the 2014 Women’s Leadership Summit moments and get ready to participate next year! And watch our first video production on our LatinasInBusiness.us YouTube channel.